Biography & Genealogy: William J. Keiter, Class of 1859 (graduated 8 out of 29). Born: ? Matriculated from Bloomery, West Virginia. At VMI 4 years. 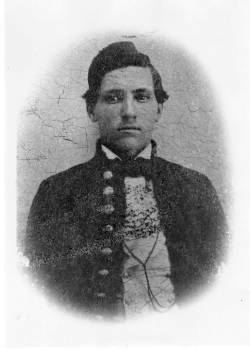 Military Record: Entered service May 17, 1861 at Nashville, Tennessee in Capt W.C. Winston's Company Tennessee Light Artillery (Belmont Battery; Capt W.J. Keiter's Company; Capt W.Y.C. Humes Company; Company C, Tennessee Artillery Corps). Appointed Capt July 17, 1861. Commanded fixed battery at Island Number 10 until October 18, 1861 when he requested and received command of a battery in Columbus, Kentucky fortifications. An exceptionally and competent officer. Killed when a 128-pounder Dahlgren gun exploded at Columbus, Kentucky. Died- November 11, 1861.